"We believe that every marriage is worth saving, and every couple can experience the promise of a great marriage," write Dr. Robert Paul and Mark Pyatt, Co-Presidents of the National Marriage Institute, on the opening page of "Marriage 911: First Response" a workbook by Michelle and Joe Williams. During National Marriage Week, the focus is usually on Valentine's Day and romantic love. We never hear about separated couples who want to rebuild their marriage. They have one foot on a banana peel, and another on the steps of a divorce court. Few get help. The best answer I've found is Marriage 911 created by the Williams, each of whom had a failed marriage before they came together, married and created their course in 1990. "We understand the pain of marriage in crisis. We want to help couples avoid the same mistakes we made," they write. "That is why we wrote the Workbook and Support Partner Handbook." They created a 12-week course, in which men meet with men, and women with women. The person trying to save his/her marriage uses a Marriage 911 workbook, and asks a friend of the same gender to meet weekly, who is given a Support Partner Handbook to know what questions to ask. No training is required. Many churches organize a class in which men sit on one side of the room, opposite the women who are also together. If a husband and wife are both participating, which is ideal, they sit with their own gender, separately. They hear a lecture and then meet, men with men and women with women. In the first month, the theme is "Where's Your Focus" - such as "Unmet Needs" and "Caring for Self." Month Two is "Where is Your Heart?" For example, "Secret Motives: Do You Really Want to Reconcile?" The third month is "Where is Your Hope?" with themes like "Know What To Avoid: God's Timing Is Not Always Ours." Debbie and Mark Johnson were on the brink of divorce when they began working with Joe and Michelle Williams. "We wanted to be married, but did not know how," Debbie told me. They began using the material more than 20 years ago, and even helped edit original chapters. They have been ministry leaders in their home church, New Life Christian Center in Turlock, Cal., near Modesto where the Williams live. One couple the Johnsons worked with had been divorced 10 years. "She came in distraught. I told her, `You should go through the material and you need to do something different." She noted many experience one marriage after another, committing the same mistakes. "I said, it is not about yourself, it's about allowing God to change you." According to Joe Williams, "Marriage Ministry 911 has had some great results. Up to 50% of couples are holding together." He said that "Couples who bring in spiritual marriages have a longer lasting marriage than those who do not. If the husband and wife work together, there will be 100% healing." Indeed, I spoke to Mark Johnson, husband of Debbie, who estimates that 70% to 75% of hundreds of couples they helped were able to save their marriage. "We invested in them, held them accountable, teaching principles that after a period of time, making marriage a safe place. "Ryan and Erin were previously married and had formed a family. They had a lot of issues, but learned they have to pursue Jesus Christ. They had been to numerous counselors with Ph.Ds, but I asked Ryan "Are you in a daily habit of reading the Bible? What are you doing to better your relationship with Jesus Christ? What are you doing on a daily basis to better your relationship with your wife?" 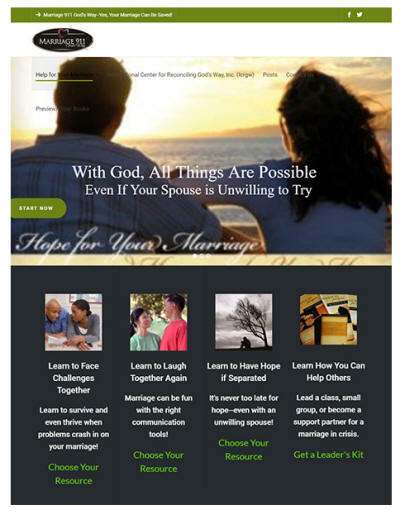 Marriage 911 helps couples discover that God has a plan for them to reconcile. It enables couples in crisis learn that separated couples do not have to divorce. A man in crisis can meet with a man who rebuilt his marriage, and a distraught woman can meet with a reconciled woman. The Marriage 911 materials provide powerful evidence that God has a plan to save all marriages. More important, it also offers materials that a husband or wife in crisis can use with a friend of the same gender to rebuild their marriage - and their sense of hope. Couples in crisis should call 209 599-2447 to order both the Marriage 911 workbook and the Support Partner Handbook for $28. Select your own partner to help. As Michelle puts it, "Changed people change people." Every marriage can be saved - and should be!